I suspect spring would not be spring for the the Fort Wayne Bonsai Club without a workshop with a visiting artist at some point! Two weeks ago, on April 16, true to form, we got together for a Styling and Refinement workshop with Vance Hanna of Birmingham, MI, a member and past president of the Four Season Bonsai Club. Darlene and Jerry Kittle kindly hosted us in their garage. I'm not sure if Vance holds a PhD, so if I should refer to him as "Doctor Hanna," someone please let me know. (He doesn't appear to be the kind to flaunt an advanced degree.) Vance has been involved in bonsai since the early 1970's, has won many awards throughout the years, and was one of the founders of the Mid-America Bonsai Alliance (MABA.) He's a natural teacher: approachable, a good listener, good at explaining, and quick to affirm and encourage. And something else hit me during the workshop: here's a man who teaches architectural design at the university level: one could hardly have a better background when it comes to addressing three-dimensional design, as we do in bonsai! Here are some pictures from the workshop. Cindy (behind the tree) nearby. After lunch we moved Vance out of direct sun! Al McMillan gets his Korean boxwood ready for Vance's attention. The chosen design was more dramatic than I foresaw. I look forward to seeing this tree develop. The tree I took was the shohin-sized yew I mentioned in my last post; for a "before" view, you can click here. (A separate window will open.) Vance listened to my ideas about the tree and seemed to like them. He offered a few thoughts and refinements, which sounded good to me, and made a quick sketch of the overall look he suggests. I liked the idea of "drum" pot idea right off the bat! And after a moment's thought I decided that the smaller jin he sketched seems to fit the tree's image better than the larger one I had envisioned. the blue one indicates the new leader. On the other hand, I'm still not sure what I think of making the tree as tall as Vance suggests. I originally intended to have the apex just above the jin. But I've got time to think about it. And I'm certainly not going to dismiss Vance's idea out of hand. He has a lot more experience with bonsai design than I do, and besides - I paid to get his ideas about the tree! The reason the question is difficult is because our weather here in northern Indiana continues to be, as I put it previously, weird! We've continued to see unusual swings in temperature, from shirtsleeve weather to well below freezing and back to balmy, all in a matter of a few days! Before the middle of March had arrived, one of my yews had already started to set this year's crop of arils. Here, that's about a month early! All else being equal, I would love the chance to start repotting a month early and gain that much on the growing season! But what makes the question difficult is that this year, all is not equal. We have the early warmup, but we also continue to have the wild swings in temperature. Together they create the dilemma. For any who may not be familiar with the nature of the dilemma - and especially readers in tropical parts of the world - here it is. Obviously, the ideal time to repot one's trees is right at the start of the spring growth flush (signaled by the swelling of the leaf and needle buds.) At that point, the roots are starting rapid growth, and the tree will recover from root-pruning most quickly and with the least trauma. Unseasonable cold throws a wild card into the game. New roots are sensitive to cold, newly pruned roots even more so. 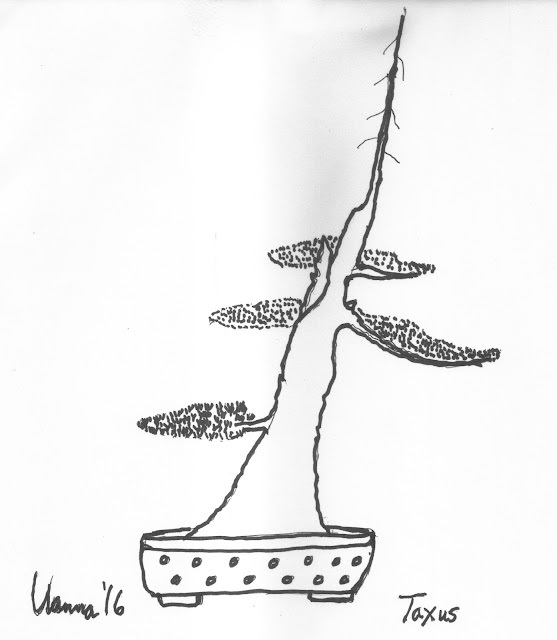 Cold slows down root growth, and thereby slows down recovery for a freshly repotted tree. Worse, too much cold, or cold that's too severe, can injure or even kill new root tissues. The other horn of the dilemma is the fact that the repotting window is limited. Miss the window, and the tree's root system will struggle to recover. If the tree is a conifer, and especially if it's a member of the Pinaceae, if the window is missed the root system usually won't recover at all. This is a lesson I have personally learned the hard way; I've killed more pines by wrongly-timed repotting than by another mistake. And this year's window has opened early. Bonsai practitioners who wait too long for temperatures to stop imitating a roller coaster risk missing the repotting window altogether. Waiting another year is then often the safest option, but has its downside: a tree that is not repotted when it needs it will start to become rootbound (or more rootbound,) and will miss out on the overall rejuvenating effect of root pruning. On the other hand, bonsai growers who proceed with repotting now risk having their trees' roots injured by a siege of atypically cold temperatures, and the trees' progress set back as a result. If root pruning has been extensive, a tree could even be killed by a sufficiently deep cold snap. I'm taking a few extra precautions. First, I'm keeping root disturbance to a minimum, even on species like trident maple that normally shrug off massive root-pruning. That means less root rejuvenation, but it also means that when temperature plunges occur, the root system has not been temporarily weakened by pruning any more than is absolutely necessary. Second, in a cold spell it's even more important to protect newly-repotted trees from the drying effect of wind. Newly pruned roots can't take up as much water to re-hydrate the leaves and twigs in the first place, and that's more true when they're cold. Extra demand for water because of desiccation of the tree above ground is the last thing they need! Third, I've been doing "The Shuffle" as needed. Saturday afternoon I made sure the repotted trees were in the mudroom in anticipation of that nite's expected low of 24 Fahrenheit (almost -5 Celsius.) The next day after church I took them back outside to enjoy a day or two of milder weather. Tonite those trees are back in the mudroom for a few days. I expect to keep up the in-and-out for several more weeks, at least. Here are pictures of two of the trees I've worked on so far. 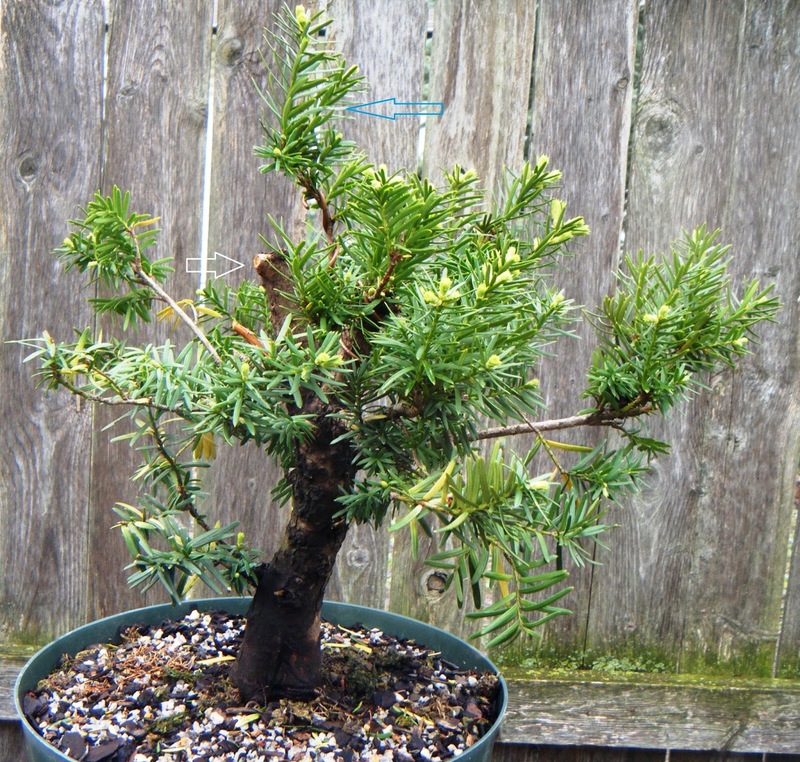 This 'Densiformis' yew is the tree I won in a raffle at the MABA 2015 convention last year. (See the end of this post.) 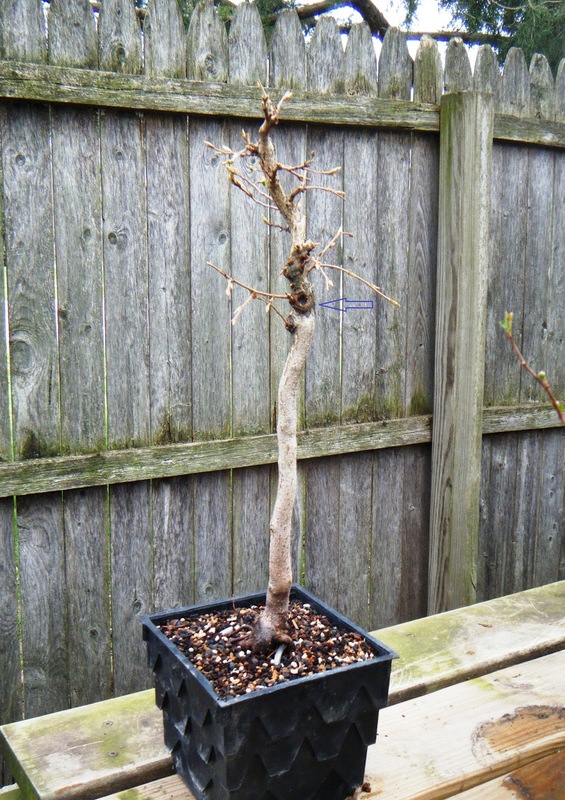 On April 16 I plan to take it to a Styling and Refinement workshop with Vance Hanna of the Four Seasons Bonsai Club of greater Detroit, so I didn't do a full repotting of this tree. I shifted just enough soil to let me correct the planting angle, did no root-pruning, and have been babying it ever since! Taxus x media 'Densiformis,' after work was finished March 13. Provisional front. Foliage buds about to burst. April 5, 2016. I've become a bit fascinated recently with the bunjin style (a.k.a. literati.) 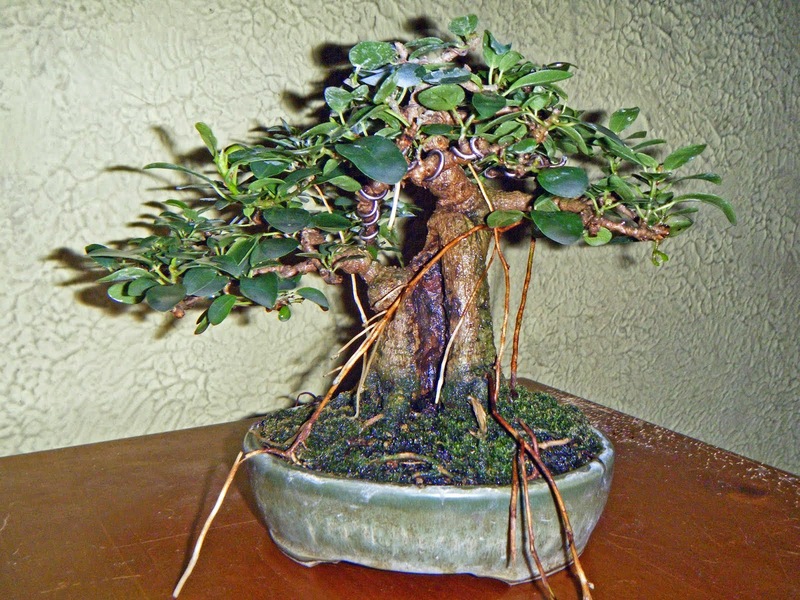 I bought this Korean hornbeam from Meehan's Miniatures last August with an eventual bunjin in mind. Carpinus coreana before repotting; March 11, 2016.
will become a small uro. Picture taken April 5, 2016. New leaves emerging on Carpinus coreana. April 5, 2016. For all my friends in the temperate zones of the Northern hemisphere: best wishes with your repotting, whenever you're able to do it!